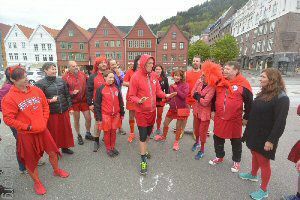 We run in or around Bergen, Norway every Wednesday at 7 p.m. all year round! If you are looking for a RUNNING-ONLY-CLUB, we might not be quite the ticket - If you are looking for a RUNNING-AND-DRINKING-CLUB, READ ON! A Hash club is often referred to as 'A Drinking Club with a Running Problem'. We hash once a week, that is to say, we run or walk or crawl, a set course marked by a hare. As this is not a race, competitive running is frowned upon. The first run is free, after that, the fee is NOK 40 on our regular Wednesday runs. Everyone who has not paid the yearly membership fee, will 'Pay As You Go Whenever You Show'. All proceeds go to BH3 and are used to sponsor the Killer Hill weekend, the Christmas run and the A.G.M. In addition, the Hare charges NOK 50 to cover the after-run nosh, beer for the circle and any mobile drink stop. Hashers pay for their own beer at pub drink stops. - Indoor sleeps at the Venue is now full!